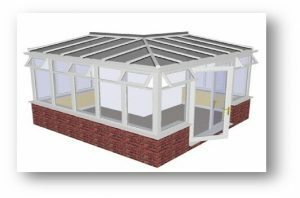 There are so many sizes, designs & styles of conservatory in the market, that it’s becoming almost impossible to give even ‘ballpark’ conservatory prices. Even when you search online many companies do not show conservatory prices on their sites. The reasoning behind this, I suspect, is due to competitiveness of the market in general, if one company lists prices then it gives the others a benchmark to which they respond by do their best to undercut the prices shown. Probably the only sure way to get accurate prices for your new conservatory is to go to a quote comparison website and get free quotes from a few installers & then compare prices for your work on a like for like basis – make sure you take each quote point by point and directly compare each quote against a set of personal criteria, especially regarding warranties, deposit guarantees and customer service – don’t get fooled by ‘price’ look at the overall ‘cost’ of doing business with the installer as sometimes cheap conservatory prices short term can lead you into expensive problems long term.